The cover story in Time this week is by me. It’s a profile of Jonathan Franzen, a novelist who is of great interest to me. The Corrections was kind of a totem for me while I was writing The Magicians. It was a transitional love object, like a teddy bear — I didn’t like to write without my copy of it handy. That and The Lion, the Witch and the Wardrobe. I put one on one side of my desk, one on the other, and wrote The Magicians in the weird magneto-literary field they generated between them. Franzen has a new novel coming out, his first since The Corrections, which was in 2001. (Weirdly it came out practically on September 11th.) It’s called Freedom. It’s good. Franzen writes in a close-third-person style that basically to me is the state of the goddamned art for literary prose. 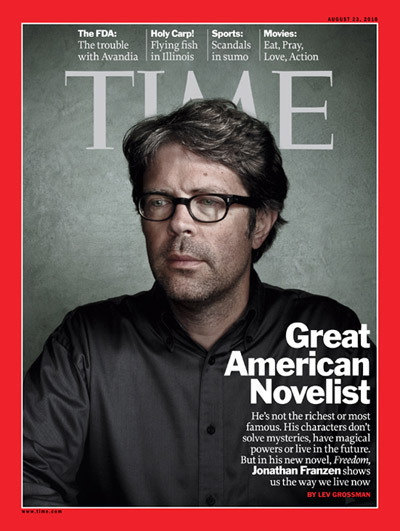 My profile of Franzen is online, or rather about an eighth of it is online. The whole thing is in the print magazine, and I think you can get it on the iPad too, but on the web it is concealed behind a “paywall,” which at this point is more wall than pay. Top-flight mad-scientist infrastructure engineers at Time Inc. are even now attempting to “enable” “online” “credit-card transactions” that would allow visitors to “pay” to read my profile of Franzen. Fools! Your pride challenges the gods themselves! I only write the cover story once or twice a year, and when I do it’s never a books story. So it’s a nice milestone for me. Now I’m in San Francisco at the Singularity Summit, where nanobots are making me immortal. At this point I would settle for online credit-card transactions. YOUR book, fine sir, has influenced me a great deal as a writer. I can’t tell you how many times I marveled, mouth agape, at your style as I read THE MAGICIANS. Kudos on your cover piece. I look forward to reading it. Vancouver canada or Vancouver washington? Canada. That’s weird, I thought we stopped doing a separate Canadian edition. I really enjoyed your cover story (and did a little silent cheer when I read the “elitist pricks” line). I especially liked the parts about Franzen’s relationship with Wallace, and the thoughts you and JF had about freedom. Saw it in the Oslo airport yesterday. My self-improvement project is to read Die Korrekturen. oh, and will be very interested to see what you make of Ray Kurzweil, with whose writings I was very infatuated with in the late eighties. I picked up this particular copy of Time that was atop a heaping pile of magazines/catalogs/newspapers in the front room of my family’s Northern Michigan cottage over the weekend. There was not much I found interesting in the magazine, but I read your profile of Franzen from start to finish. Having never read any of Franzen’s work, nor having ever heard of you (sorry!) I am now an ever-after fan of both. I picked up a copy of The Corrections at the airport Sunday night; I have your blog bookmarked and am seeking out copies of your prose. I am disappointed that I can’t find a copy of the article online, as I wanted to forward it on to a few literary friends. Great writing.